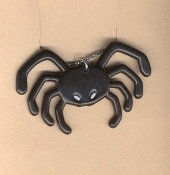 Scary Black SPIDER PENDANT NECKLACE - Halloween Goth Emo Jewelry - Plastic dimensional, detailed Scary BLACK SPIDER w/ Outspread Legs. Charm approx. 1.25-inch (3.13cm) tall x 2-inch (5cm) wide, on 18-inch (45cm) Neck Chain with safety clasp.